SALTO’s JustIN Mobile echnology allows guests to use their smartphone as their room key.The intuitive SALTO JustIN Mobile app communicates securely via the Cloud and enables a guest to receive his key online, anytime and anywhere. When guests arrive at your hotel, they can choose to go straight to their room and receive their key on their phone, or they can ask for assistance at reception. It’stheir choice. Technologically cutting-edge, SALTO mobile key means the end of lost key hassles, expense and waste. Plus, the technology isn’t limited to hotel rooms -- it can also be used on main entrance doors, elevators, car park barriers, meeting rooms, etc. It’s the ideal solution for any door where you need to conveniently control access. Smartphone authentication technology for verifying a mobile user’s identity: PIN / Fingerprint. Encrypted data transfer between phone and lock means secure authentication. Fast and highly secure data transmission and anti-cloning technology protection. 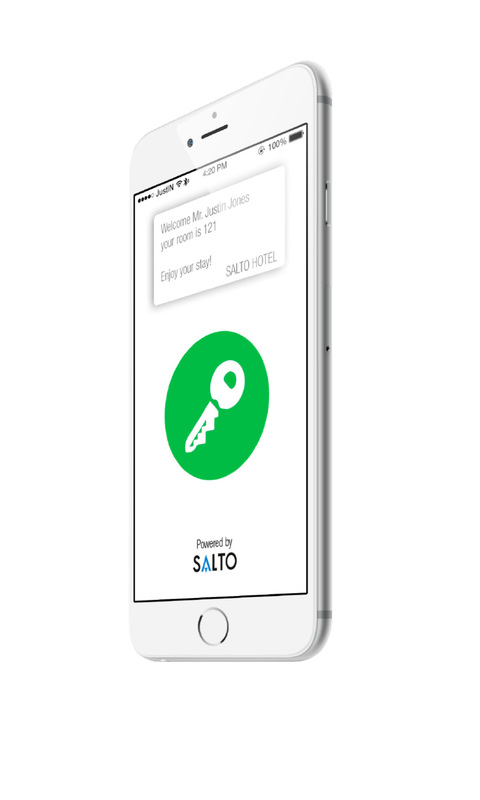 SALTO’s intuitive app lets an enduser receive his keys online, anytime and anywhere. Works with the guest’s existing iOS and Android smartphone devices. A true welcome for your guest.• Positioning as smart hotel, technologically cutting-edge.